Water treatment by Ultraviolet radiation is one of the safest technologies among non-reagent disinfecting methods. Low-pressure Ultraviolet lamps that are traditionally used for water disinfection are not effective at killing spore-forming bacteria, viruses, fungi, algae and mould. Radiation intensity needs to be of the order of 100-300 MJ/cm2, however, low-pressure Ultraviolet units struggle to deliver 16 MJ/cm2. A substantial limitation in the application of this water treatment method is the build-up of salt crystals and biological products on the protective quartz jackets of the Ultraviolet lamps. The LAZUR system overcomes the limitations of conventional Ultraviolet disinfection through the continuous treatment of water by Ultraviolet radiation at wavelengths of 253.7 nm and 185 nm with simultaneous treatment by ultrasound at around 2 W/cm2. What are the advantages of this method of water disinfection? When a water flow is treated by an ultrasonic emitter located directly in the Ultraviolet radiation chamber, short-lived steam-gas "cavities" (bubbles) form in the water under low pressure. When the water is pressurised, the bubbles "burst out ". The rate of bursting is very high and high temperatures and pressures are created in the proximity of these bursting points. The "cavities" are formed in the volume of the Ultraviolet chamber, mainly on "non-uniform structures". Those "non-uniform structures" can be spores of fungi and bacteria, and act as a nucleus for the formation of gas cavities. The high temperatures and pressures generated at these cavities destroy pathogenic organisms in the vicinity. At the same time, free radicals, ozone, hydrogen peroxide (H2O2) and other active substances are generated in the bubbles under "harsh" Ultraviolet radiation at 185 nm wavelength. Because of the multitude and small size of the bubbles that have a tendency to burst, the free radicals are uniformly distributed through the water and then destroy remaining pathogenic organisms. Ultraviolet radiation essentially stimulates the disinfection action of the free radicals. Power consumption of this method of water treatment is about 7-8 W per m3/hour, and service life of the units is not less than 16,000 hours. The ultrasonic transducer fitted inside of the Ultraviolet chamber also provides a cleaning action that prevents the build up of biological films or chemical residue on the quartz jacket of the Ultraviolet lamp. 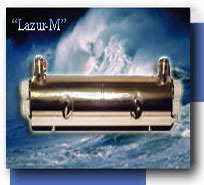 The table below shows the results of a lengthy series of tests with the Lazur-M system conducted by the Rand Water Board (South Africa) in 1998. Test: aspergollus niger (the most hardy species of mould spores known so far). This kind of mould spores can not be killed by either Ultraviolet or ozone. Rand Water Board's scientists concluded that LAZUR disinfection technology is 100-1,000 times more effective and the costs are 2-3 times lower in comparison with the traditional treatment methods. Currently, the tests of water disinfecting units with 50 m3/h productivity are being carried out in Pretoria (South Africa) and Wellington (New Zealand), for plants of up to 150,000 m3/hour total capacity. Technical and Economic characteristics of equipment for water desinfection with ultra violet rays treatment.